Maria Sharapova began Act II of her storied career on Monday when she shrieked her way into the second round of the French Open with a 3-6, 6-1, 6-2 victory over Anastasiya Yakimova of Belarus. Twelve months after competing in Paris as the world number one, the Russian turned up ranked 102nd as she is on a comeback trail following a nine-month layoff with a career-threatening shoulder injury. After not knowing for months whether she would ever be able to return to the big stage again, Sharapova is delighted to be back in Grand Slam action. "If I was a mentally weak person or individual, I wouldn't be here today," Sharapova, who was unable to defend her Australian Open title in January, told a news conference. "I'd be on some island ... with a nice cold Pina Colada and a nice cold towel they hand around at the pools. "But I love being here ... There's no better feeling than going on court when they call your name and, especially in these days, to know that you have an opportunity to go out and play and have a job." Playing her first Grand Slam match since losing in the second round of Wimbledon last year, the 22-year-old needed a set to find her range on Court One before cracking winners past the world number 64. Yakimova called on the tournament's trainer at change of sides at 4-1 in the second set to have her lower back massaged and she never seemed to recover. 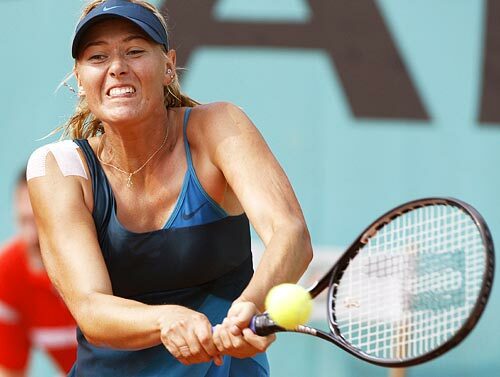 Sharapova, who returned to singles play last week at the Warsaw Open where she reached the last eight, will next face 11th-seeded compatriot Nadia Petrova. Asked if she felt like she is starting a second career, Sharapova said: "Yeah, in a way. Definitely. "It's the first time in my life where I couldn't practise for such a long period of time. I think it was three months where I didn't touch a tennis racket. "There are so many times I thought, 'oh, I'll be back in Australia, or, oh, I will be back in a few weeks.' Every single time it was disappointment after disappointment because you couldn't achieve that goal. She did, however, find a silver lining in her layoff. "I did have an opportunity to have a normal life and I think when you're travelling 11 months out of the year, always on the go, and you never have the time to actually settle down and appreciate the very little things that you have in life and the number one thing is your family," Sharapova said. With a new sense of perspective, Sharapova is realistic about what she hopes to achieve in the only Grand Slam she has failed to win. "I don't really have expectations, to be honest," she said. "I think this is the first time in my career where I can really say I don't have any expectations, I don't know how things are going to work out."